In Parco della Giara, the horses forgot to keep up with evolution and remain as small as they were some 10,000 years ago. Today we have another guest post from the Sardinian freelance writer and photographer, Angela Corrias. This article has been adapted from one originally published on Angela’s lovely blog about her homeland, Sardinia, Chasing the Unexpected. 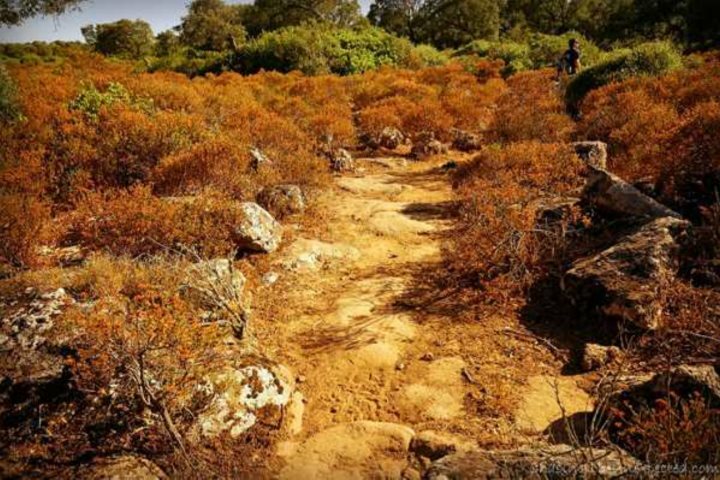 Parco della Giara, south east of Oristano in Sardinia's wild interior, is a wonderful plateau that originated 3,000 years ago on top of two extinct volcanoes. 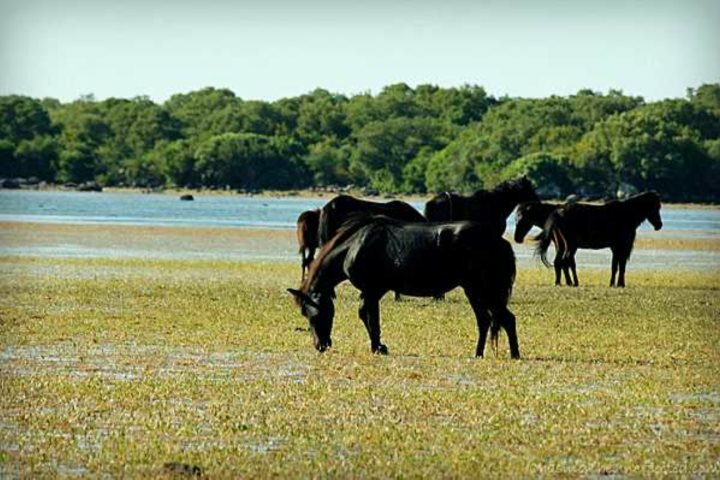 Here the only dwellers are wild animals, be they wild pigs, cows, birds, or horses. While all other wildlife has more or less caught up adapting to natural changes, the horses have remained as small as they were about 10,000 years ago. They are not ponies, they are normal horses, just smaller. Their elegance would make them a longed target for collectors and horse lovers, if they weren’t protected and so impossible to touch, feed or change in any way their living conditions. The small horses are wild and so they have to stay. They are helped with food only in case of a very bad drought that would undermine the growth of vegetation they need to survive. Apart from these spectacular animals, Parco della Giara offers an extraordinary variety of plants, trees and flowers. Every season reveals itself in the form of different vegetation, different colors and different smells. Similarly, visitors’ experiences vary. In spring, we can see the horses grazing on a beautifully colourful sweep of flowers. In summer we can see them in the water. In autumn sensual golden hues give the surrounding its inevitable romantic ambiance and in winter, when it snows, the white makes the view just as stunning. Since we went in summer, we were lucky enough to be granted with the sweet sight of these small horses cooling down in the lake, grazing on some water vegetables and looking at each other. Although we were extra careful not to bother them, perhaps they noticed our presence all the same. In fact when we were about to leave, a small family of three (male, female and newborn) came near, probably after wrangling with other members of the same herd. In fact, the stallion marked out its territory straight away placing its dung where they were supposed to stay. Life is tough for horses in the wild, making them live for about twenty years. So the question is, if you were a horse, would you prefer to live free in the wild for twenty years, or inside a stable for forty? My guide, Roberto, native from Tuili, one of the villages bordering the park, maybe due to their inner free spirit, had no doubt: even though life conditions were harder, he would totally prefer to be free to run and enjoy nature in the plateau for half a lifetime compared to domestic horses. Going to Parco della Giara makes you sense how living in the past was, when shepherds used to spend the night in the countryside, making cheese, ham and other food in thatched huts and guarding their sheep and cows from foxes and thieves. 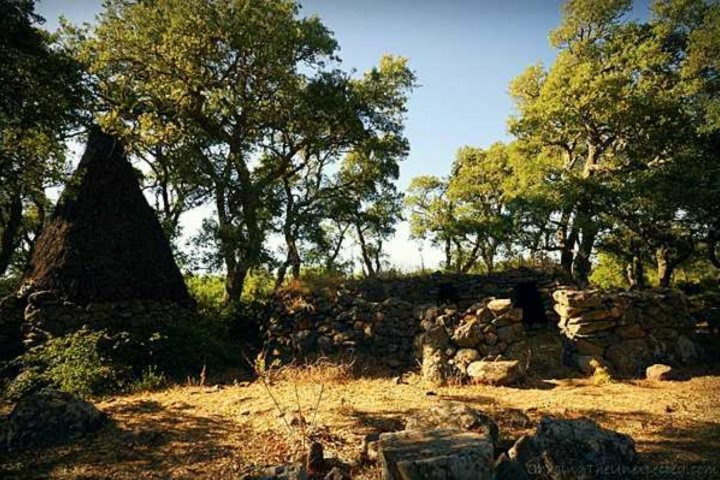 Maybe a not so remote past in Sardinia, where this was the lifestyle only forty years ago, perhaps harder than now, but also with a different relationship with nature. As Roberto suggested that every season makes the park worth a visit in order to admire different aspects of it. This year I ticked summer off the list and promised myself I must go back at least three more times to cover the whole year. Our guide, Roberto, leads us through the path towards the lake where we would find the small horses. Parco della Giara is surrounded by many villages, and a tour is available from more than one of them. I booked mine from Tuili, picturesque and traditional hamlet right on the valley looking at the plateau. My tour guide was Roberto, owner of Jara with his wife, with an amazing knowledge about both the horses and the rest of the wildlife, plants, trees, flowers and purposes now and in the past in the plateau. Should I go back, I wouldn’t hesitate booking him again and I feel I can absolutely suggest him to whoever wants to go. His mobile number is +39 348 2924983, his email info@jara.it and his website for more details is Parcodellagiara.it. See Angela’s original article in full, including a video of the horses here.